By the incorporation of different fields of interest (print and performance) we want the audience to experience the relevance of print as a performative vehicle. This is printmaking expressed through durational performance and risk taking to create a mashup of ideas about live art, printmaking, identity , endurance and stereotypes. Performprint encompasses the full spectrum of print and performance practices respectively. 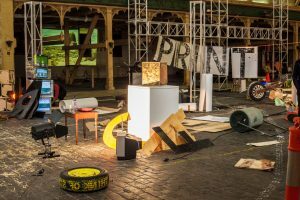 Performprint blends theories on copy based technologies through print informed works and ideas of future human scenarios into live durational performance work. This is bravado, masculinity, feminism, reproduction and politics expressed through durational performance. The primary members are Joel Gailer, Jenny Hall, Boris Falovich and Michael Meneghetti.